A space in the ocean where human activities are more strictly regulated than the surrounding waters – similar to parks we have on land. They are supposed to form a network of safe areas for marine life ro repopulate and bring back big populations to our oceans. You can see that they aren’t that large, nor extensive, but serve as a good starting point. Here are maps for each of the regions: San Diego, Los Angeles (Santa Monica Bay), Orange County, Santa Barbara, Catalina Island. The Unites States of Pie – yum! We hold this truth to be self-evident: America loves pie. Food writer Adrienne Kane celebrates that right. She has gathered those regional pie recipes into a new cookbook, United States of Pie. Continue reading The Unites States of Pie – yum! Posted on July 10, 2012 Author robotchampionCategories defaultTags 1886, adrienne kane, bakewell pie, bakewell tart, banana, brownie, california, chocolate, chocolate raisin pie, country, cream, dairy, english dessert, fruit, grape, housekeepers guide, paper bag, pie, raisin, raisinets, sack pie, southern california, the unrivaled cook-book, united states of pie, whole grain1 Comment on The Unites States of Pie – yum! San Onofre Nuclear Plant shut down for the summer – does Southern California still need it? This summer may be just a test run for operating Southern California’s electrical grid without a nuclear plant. The latest report on the outage at the San Onofre Nuclear Generating Station shows the replacement of four massive steam generators was accompanied by serious design flaws, with no clear solution in sight. Both stakeholders in San Onofre and critics of nuclear power say the start of a summer without the twin-reactor plant has forced a new accounting for its costs and benefits. The utility industry and the state’s main grid operator are “considering a range of existing and new alternatives for mitigating the impacts of a long-term or permanent shutdown at San Onofre,” said Stephanie McCorkle, a spokeswoman for the California Independent System Operator. At full tilt, San Onofre can produce enough electricity to power 1.4 million homes. Yet the grid operator foresees only the remote chance of rolling outages during hot weather in the next three months — when San Onofre is needed the most. Keep reading – San Onofre: Do we really need it? Continue reading San Onofre Nuclear Plant shut down for the summer – does Southern California still need it? Posted on July 8, 2012 Author robotchampionCategories defaultTags benefit, california independent system operator, cost, design flaw, electricy, energy, generating, grid, homes, hot weather, need, nuclear energy, nuclear plant, power, replacement, san onofre, solution, southern california, station, steam generator, stephanie mccorkle, summerLeave a comment on San Onofre Nuclear Plant shut down for the summer – does Southern California still need it? Every week I read the surf column from local surf legend, Corky Carroll, and this week I was delighted to find him musing about the ideal after-surf food. For young whippersnappers, like me, these stories let you know how long surfers have been catching waves and scarfing afterwards. Enjoy Corky’s stories and afterwards I’ll share my modern-day favorites. Whenever the subject turns to hanging out at the Huntington Beach Pier in the ’50s and ’60s, somebody always mentions “strips.” I mentioned them right here not long ago myself. Strips were these fairly soggy and extremely greasy tortilla pieces that were drowned in some sort of cheese substitute and a kind of catsup with a hint of Tabasco. We all loved them for an after-surfing snack. I am not sure what kind of nutritional value they had, but at that time nobody cared about that stuff. I was sitting at the Sugar Shack not long ago woofing down a stack of their amazing pancakes and thinking that there just is not a much tastier after-surf breakfast than that, especially with a side of bacon to go along with it. There have always been those certain little taste treats that stick out in your taste-bud memory banks. I remember the Helms bread truck that came down our street every afternoon at about 4 o’clock. It had the most amazing cream puffs known to man. I would beg my mom for the 12 cents. They also had a good glazed donut for a nickel and chocolate and maple bars for a dime. But the ultimate was the cream puff. For the best seafood, like fish tacos, burritos, tuna tartare, even a grilled artichoke – check out Bear Flag Fish Company. You normally think of parks as being places to walk or ride around. But on January 1, 2012, Southern California celebrated the grand opening of a series of underwater parks, or “marine protected areas,” that includes wildlife hot spots such as the La Jolla kelp forest, Laguna tidepools, and Catalina Island coral gardens. These parks will join a growing system that currently dots the shore from Santa Barbara to Mendocino, and will soon stretch the length of California’s coast. 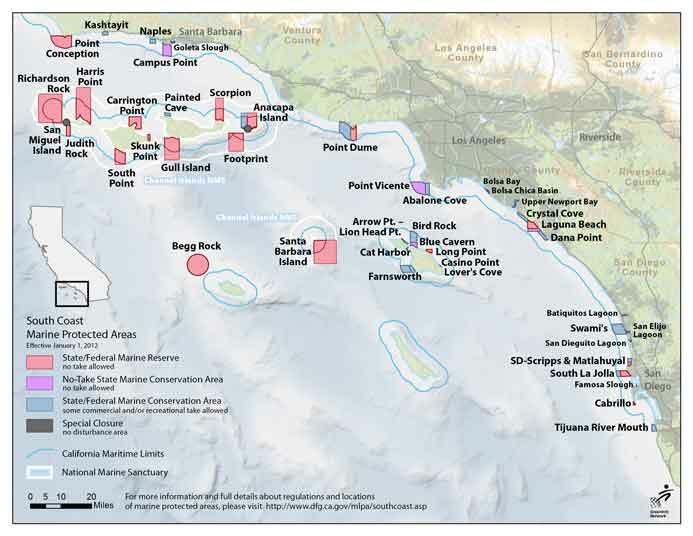 California will be the first state in the nation to develop a science-based statewide network of marine protected areas, protecting productive reefs, kelp forests and tide pools while leaving about 90% of state waters open to fishing. The Marine Life Protection Act (MLPA), enacted in 1999 with bipartisan support, called for this network of protections to improve the health of California’s ocean wildlife and habitats. Coastal tourism and recreation are a major economic engine for California. A recent study showed over 90 percent of coastal recreation in southern California involves beach-going, diving, wildlife watching, surfing and other activities that will benefit from healthier oceans. According to the National Ocean Economics Program, California’s coast and ocean generate $22 billion in revenue and drive over 350,000 jobs each year. All across America you can find beautiful front lawns with green grass and sprinklers. Even in places where water is scarce, like Southern California and Arizona. Those areas import water at a great expense and in some cases dry up the source. In response, many living in these areas have developed new ideas about front lawns. There are many plants that require a fraction of the water that grass does, and can still be as green. Or, in some cases provide a variety of colors, shapes, and designs. Most of these plants are called drought resistant, meaning they don’t want to be watered. I have a few of them growing in pots and they wilt when I water them. So far, the occasional rain that comes has satisfied their needs. 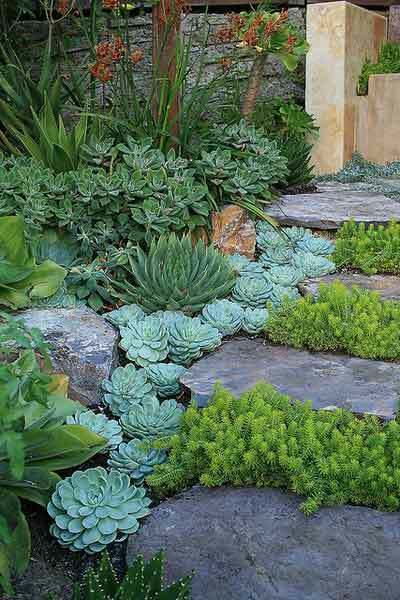 Stepping stones edged with succulents. Radioactive particles released in the nuclear reactor meltdown in Fukushima, Japan, following the March 2011 earthquake and tsunami were detected in giant kelp along the California coast, according to a recently published study. Radioactive iodine was found in samples collected from beds of kelp in locations along the coast from Laguna Beach to as far north as Santa Cruz about a month after the explosion, according to the study by two marine biologists at Cal State Long Beach. The levels, while most likely not harmful to humans, were significantly higher than measurements prior to the explosion and comparable to those found in British Columbia, Canada, and northern Washington state following the Chernobyl disaster in 1986, according to the study published in March in the journal Environmental Science & Technology. The highest levels were found in Corona del Mar.